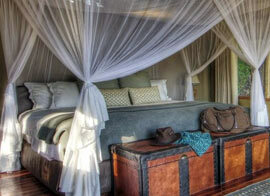 Ker & Downey Botswana is a name that is – and always will be – associated with exclusive safari experiences. Ker & Downey Botswana has developed into one of Botswana’s most esteemed safari operators over the past five decades, representing luxury service and personal attention to detail. Ker & Downey Botswana are committed to providing guests the highest quality wildlife and adventure safari experience, whilst preserving the delicate environment and natural beauty of Botswana. They constantly strive to maintain standards of excellence within the industry whilst fostering economic and social development of the local communities and Botswana as a whole. At Ker & Downey Botswana we are committed to providing guests with the highest quality wildlife and adventure safari experience, whilst preserving the delicate environment and natural beauty of Botswana. 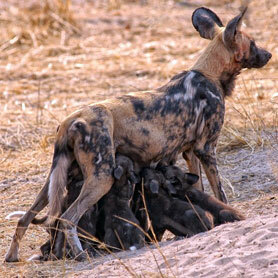 The Ker & Downey Botswana Safari Package combines the perfect blend of experiences. 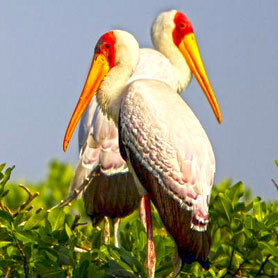 Kanana, Okuti and Shinde complement each other perfectly, offering a diverse range of habitats and wildlife encounters. The Ker & Downey Botswana Family Package will contribute a percentage of its profit to Bana Ba Letsatsi – Ker & Downey Botswana's social responsibility programme. 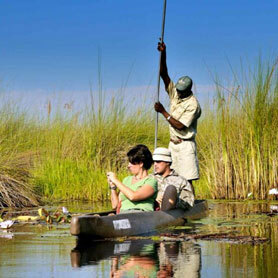 With this walking safari you enter one of the great, untamed regions of Africa: the spectacular Okavango Delta. 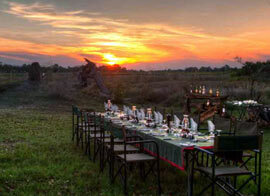 Experience the astonishing contrasts created when the mighty Okavango River flows into the arid Kalahari Desert. The package is a specially designed safari which offers families the opportunity to discover the wonders of the African wilderness together. 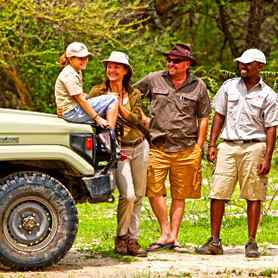 This adventure safari is based at our adventure camp. 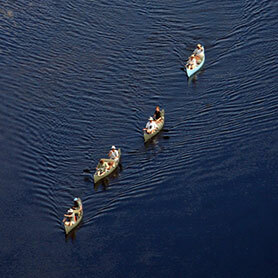 The trail is an expeditionary canoe and walking safari along Botswana’s captivating Selinda Spillway, connecting the northern part of the Okavango Delta with the Linyanti Swamps only. 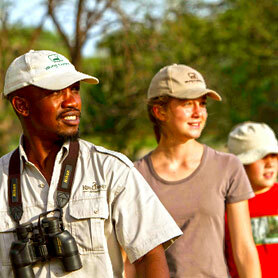 Young Explorers package is a specially designed for families to discover the African wilderness together. 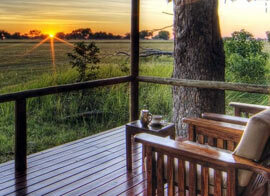 There are two Footsteps camps, both in spectacular and untamed areas of Botswana – both must see regions. 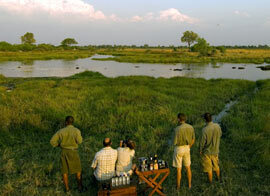 Kanana is a hidden jewel on the Xudum River, Kanana is located in the southwest of the Okavango Delta. The new exclusive location of the Khwai Tented Camp, on the banks of a lagoon flowing into the Khwai river. 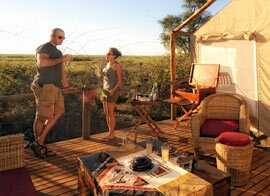 Linyanti Bush Camp is situated on the banks of Linyanti Marsh in a private reserve which borders the western boundary. 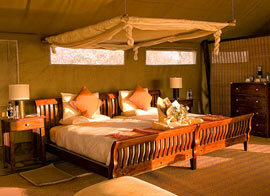 Linyanti Ebony is situated adjacent to Linyanti Bush Camp, in a private concession on the banks of Linyanti Marsh. 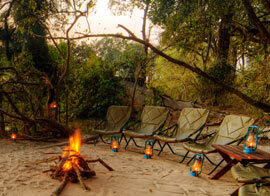 This delightful camp lies alongside the Maunachira River which flows through Xakanaxa Lagoon in Moremi Game Reserve. 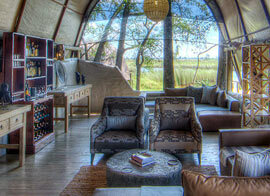 Nestled on a lush palm island in the heart of the northern Okavango Delta, on the edge of Shinde Lagoon. This is an exclusive ‘camp within a camp’, offering the ultimate in personal service and an indelible wilderness experience.